Tony Abbott is determined to throw billions at the East West road tunnel if he’s elected, despite not having seen the business case. The public hasn’t seen the business case. Neither has Tony, as it turns out. But he has faith. He believes it exists. 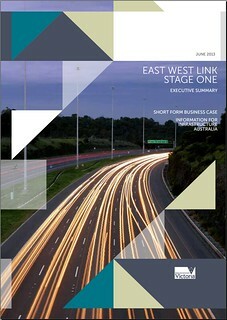 I mean, there are lots of things that I haven’t seen but I know, and I know that there is a business case for the East West Link. All the public has been able to see is an 8 page summary. Because apparently that’s all the scrutiny we’re allowed when the biggest single transport project the state has ever considered comes onto the radar. One page per billion dollars to be spent. Oh well. I had a look through it, glossy pictures and all. Here are some comments. The need to improve access to the highly productive core of Melbourne and enabling the knowledge sector to grow. Isn’t the knowledge sector centred around the CBD and university/medical precinct, the very areas they claim the road tunnel won’t serve (and which are better served by PT because they rely on high density) ? Not sure how more expensive (to use) toll roads help this, particularly as a key part of equity is having a choice, but most have no choice but to drive (meanwhile some in our community can’t drive. And of course tolls make driving even more expensive. p3 > In particular, north-south tram routes are severely hampered by lack of priority across the heavily trafficked Alexandra Parade corridor. That can be solved without building more road capacity. It is quite possible to give priority to high-capacity modes, but [gasp] giving them priority. p4 > Eastern Freeway widening between Hoddle Street and possibly to Tram Road, and managed motorways between Hoddle Street and possibly Springvale Road. Danger of using the long-reserved Doncaster rail alignment? Unclear. p4 > CBD-oriented public transport enhancements that are enabled by changed traffic patterns and which support greater productivity in inner Melbourne. So they seem to admit that greater inner Melb productivity is based on better PT. All possible without the road, of course. In fact, better without the road, as there is then more money around to upgrade PT. Note this refers to stage one (eastern end) only. p5 > Travel time savings will be experienced by users of the project as well as users of other roads in the Melbourne network that experience reduced flows, including passengers in trams and buses. Their travel time savings diagram available on the same web page goes into more detail: they say trips from Ringwood to the airport will be 20 minutes quicker; Box Hill to Footscrayish 20 minutes quicker; Box Hill to Port of Melbourne 20 minutes quicker. These are all at peak times. As we know from the SE Fwy, this doesn’t last. Some good figures here showing what happened — in summary, when the freeway opened in 1988, traffic on High Street Road and Waverley Road dropped markedly. Within ten years it was back, thanks to induced traffic. In fact in my view, the only way to lock-in reductions in traffic is to reduce capacity on those existing roads. p5 > Travel time benefits for all parties have been captured in the economic appraisal. The economic results suggest that, across the broader Melbourne transport network, there will be very substantial travel time savings. p7 > The core result shows a benefit cost ratio of 1.4 including wider economic benefits as appropriate for a major project of this nature targeting economic growth. When my kids hand in school work, they have to show how they got to the result. Just sayin’. p8 > Availability Payment Public Private Partnership (PPP) model with tolls retained by the State. Hooray! Everything’s underpinned by taxpayer risk! Anyway, have a read yourself. The problem with it is, of course, it doesn’t answer anywhere near enough for a project of this size. The government continues to claim commercial-in-confidence, but given a project most people don’t want, and the huge cost, and the fact that it will be underwritten by us taxpayers, and the fact that it wasn’t flagged they’d do it before the last election, and they’re crowing about wanting to get all the contracts in place before the next election… well, this is not their greatest moment in openness and accountability — more information should be provided to justify it. PS. It’s not hard to see why the Big End Of Town is behind the project… and it’s not necessarily about business productivity. We should demand that 1 lane in each tunnel is dedicated to buses. That would be the only salvation of this money pit. The only way this project will be stopped now is if it’s somehow delayed beyond the next election. And probably the best way to delay something is to challenge it in court. Are there some grounds for a legal challenge based on the lack of consultation? Who could fund it? And who would be best to mount such a challenge? It’s all about freight, and the port at Hastings; the “business case” is probably heavily slanted towards freight, but they don’t think that’ll sell it to the public. The Metro tunnel is needed for the Dandenong/Pakenham line to be able to take any more trains. From the Investing in Transport report aka the Eddington Report it is at capacity and cannot take any more traffic. This also means no more freight trains going to/from the Port of Hastings. just saying that labor is funding the Westconnex road project in sydney without needing to see a business case.